This was my conversation with ipowerweb support today. There is no surprise. Their customer service level is very consistent in the last few years. The conversation was near 1 hour. There are always several minutes to 10 minutes wait between my last sentence and his answer. Welcome to IPOWER! You are number 15 in the queue. Your wait time will be approximately 7 minute(s) and 30 seconds. We apologize for the wait time. Please hold for a site operator to respond. We appreciate your patience. All operators are currently assisting other customers. Please continue to hold and we’ll be with you as quickly as possible. In the meantime, please be prepared to answer your Security Question when we begin chatting. To enhance our security protocols, we’ll need you to provide the answer to your Security Question at the beginning of our conversation. If you have not yet set your Security Question and Answer, please log into your account now to set it up. Thank you for waiting. provide the answer to your Security Question at the beginning of our conversation. If you have not yet set your Security Question and Answer, please log into your account now to set it up. Thank you for waiting. Steven Davidson: Hi . My name is Steven, how are you today? Steven Davidson: How can I help you today? wangjianshuo.com: and I cannot connect to the MySQL server. wangjianshuo.com: What is the new MySQL host name? wangjianshuo.com: Localhost seems is different database than the shared server. wangjianshuo.com: What is the new DBHost setting? Steven Davidson: 1. Log into the Control Panel with your account username and password. Steven Davidson: 2. Click on the link ‘Set Security Question’ under ‘Account Information’ section. Steven Davidson: 3. Click on the radio button ‘New Profile’. Steven Davidson: 4. Enter the First Name, Last Name, and set the Security Question and the Security Answer. Steven Davidson: 5. Click on the ‘Save’ button. wangjianshuo.com: Can you answer my question now? wangjianshuo.com: but I cannot use it to replace localhost. wangjianshuo.com: What should I do? wangjianshuo.com: Are you still there? wangjianshuo.com: I cannot find the setting anywhere on your site. Steven Davidson: Please provide me with the answer to the Security Question: What is your mother’s maiden name? Steven Davidson: Thank you for the authentication. wangjianshuo.com: This should be a common question, and you should put it onto your web site. Steven Davidson: You need to change the host name for the database in the config.php file. wangjianshuo.com: What is the host name? Steven Davidson: Can you please hold while I look into this for you? I should have some more information regarding your issue in 2-4 minutes. 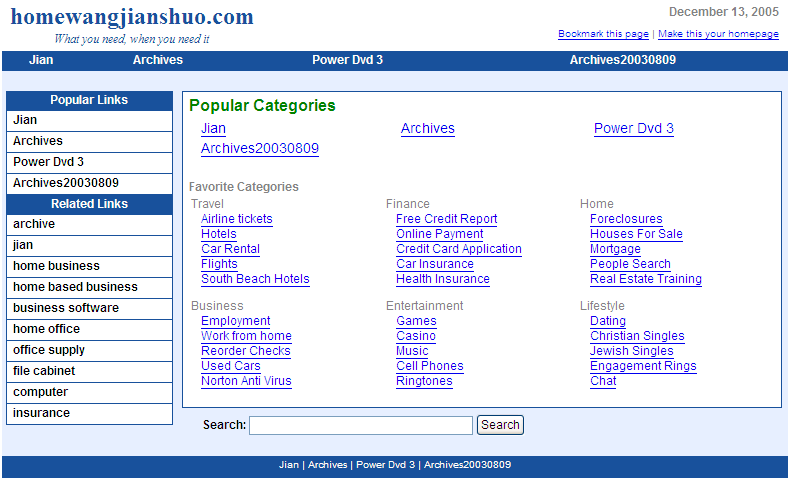 wangjianshuo.com: I just want to have a database name that works. Steven Davidson: Can you please hold while I review your account and get back within 2 to 3 minutes? Steven Davidson: Thank you for holding. Steven Davidson: You need to change the hostname for the database wangjian_blog_2007 in the path cgi-bin/mt/mt-config.cgi . wangjianshuo.com: I know. What is the host name? wangjianshuo.com: That is my original question. Can you tell me what I should put into the DBHost? wangjianshuo.com: Do you know the answer? wangjianshuo.com: Then what is the connection string? wangjianshuo.com: That is all I need from you. wangjianshuo.com: I don’t believe I am the only customer asking this question. Everyone need it. Would you please check around and give me an answer? I have been waiting here for half an hour and so did you. wangjianshuo.com: Are you still there? You always seem to disappear. Welcome to IPOWER! You are number 6 in the queue. Your wait time will be approximately 3 minute(s) and 0 seconds. We apologize for the wait time. Please hold for a site operator to respond. he answer to your Security Question at the beginning of our conversation. If you have not yet set your Security Question and Answer, please log into your account now to set it up. Thank you for waiting. Steven Davidson: Hi Jian. My name is Steven, how are you today? Steven Davidson: Did you receive my last message? Steven Davidson: I’m sorry, it appears that we may have been disconnected. I am going to close this chat, please feel free to chat with us again. This was partly my fault since after waiting for one hour, I didn’t catch the 1 minute window, and when I check this window again, the session has already been terminated. P.S. Please note the interval between every "We appreciate your patience" was set to be 2 minutes. I saw 33 of them during the technical support process. Wangjianshuo.com was not accessible since the last time I posted. The cable was completely cut off, and I am using a proxy to get very slow access to the site. Just want to post a note to let people know I am still OK, but I am not able to update the blog since I cannot access the site from China now. Hope the Internet cable between China and the rest of the world is repaired soon. Optimistic opinion is, it will be OK within 2 or three weeks. Today, very limited Internet access to outside China was recovered. Many sites are still not accessible. People in U.S. should have no problem to visit this site. Some technical background: This site is hosted in U.S., and updated from Shanghai, daily. You may noticed two days of server outage. Don’t worry. It is another technical support case with lunarpages.com. They like to suspend a site first, and drop you an email that “please contact me”. After that, it seems the guy who suspend it never appeared. So, in the next 48 hours, (or even 56 hours), there were no one response to the ticket. They have educated me that the only thing I can do is to wait, since my future request will cause my ticket to be put into the back of the queue again, causing the delay… So I waited. Finally, I found myself smart (will you call it smart), that I submitted another case, and it was solved quickly (in 30 hours). Anyway, I feel happen when I see the blueish screen of this blog. This time, I really learnt to be patient, and this time is not that hard as the previous 10 day server down. I found myself never work well with a host company. I moved from ipowerweb.com to lunarpages.com for hosting, but again, I was driven mad. Every time I have to write or talk with a technical support guy, I am completely mad. Every single word I read or hear lead to the thought in my head: “I have to kill someone.”. Just kidding, but it is exactly what I feel. How painful it is to work with someone follow a process, and cross the different time zone. It is hard. 1. Every morning, when I check my mail box, I always cannot see my response from lunarpages.com. Then I asked is there any update. Two days later, I was told that “Every time I add a note, the case will be put to the end of the queue again.” So if I am worried, and I need urgent assistant, the more I write, the slower my response will be. OK. I accept this. 2. Although I am worried, I kept patient and don’t touch the case. I expect a response within 24 hours, but two days later, I get another response. So, remember when dealing with a host company, be patient. Plan a 72 hour server down time. 3. Time zone is hard. Sometimes, when I add a note, waiting for the next morning, and only get one note: “Can I verify your identity? What is the last four digits of your credit card”. I replied and wait. Two another day past. Finally, when we reach some agreement for an action, support guys will ask: Can you confirm this? I said “I confirm”, another two days go away. 4. Telephone may helps. If you call, I feel lunarpages.com did wonderful job on telephone support. They only ask me to stay hold for 7 minutes, while on ipowerweb.com, they can easily say: “Expected waiting time is 27 minutes”. I think the definition of “how long is long” in China and America is different. It is unbelievable to have someone wait on telephone for half an hour. Telephone system does not have emotion. People have. After another 10 drilling experience, I said: OK. Forget about the old entries, and forget about the comment I lost. Let me start from March 25, 2006, and stop working with the guys in lunarpages.com. It is just because my expectation always does not match the host can provide. 1. Someone response my email with two days. 2. Any very simple server request like backup files, or get a file, should be solved within 7 days. This expectation has been lowered a lot after working with hosting companies. That is the reason when someone ask my recommendation to hosting companies, I said: It is hard to recommend, since everyone is “bad”. You will get angry with anyone. The only difference is, how angry you are. So no update these days. Waiting for the restore, so the new entries won’t be overwritten… Sorry for the inconvenience. This site was rolled back to March 15 by my ISP – Lunarpages. I have sent email to ask for the latest version (March 20). This change is expected to happen in the next 24 hours. All comments (including this post) coming after this post will be erased. So do not comment, or keep a copy of your comment if you do. Oh. I almost forget how to blog after 8 days – almost the longest pause in the history of three years. Let me explain what happened in the last 8 days. First of all, I’d like to thank ipowerweb for hosting my site since April 03, 2004. The migration to ipowerweb was very painful, so did everytime I talk with them, but I have to say, the hosting experience was not bad – they only experienced very few server down, and for the rest, it is fast and smooth. But whenever customer service is needed, it will be exteremely bad experience for me. On Dec 13 (U.S. Pacific Time, and shown as Dec 14 in my blog), my site was suspended by the abuse department. The reason is, they found there are phishing content on my website – which is comment posted by my readers, known as comment spams. There are too much comment spams on my site – that according to the log, every hour, there are at least 20 comments or trackback spam attack for this blog, 24 hours a day, and 365 days a year. So I used blacklist to filter the spams, and added almost 3900 banned words and URLs that frequently appeared in comment bodies. Even so, there are still huge amount of comment spams appearing on my site, as many of you may see everyday. It was my job to delete everyone of them – about 4 – 5 everyday. Despite of all the effort, currently, there are still some spams out of the exisitng 13351 comments. Among them, at least one was phishing content that ask people to send their account information to them. That is the factor that triggered the abuse department of ipowerweb, so they suspended my account. Since all the data were destroyed, I managed to pulled out the data from database, and reconstructed the site. Thanks God that I still know some technical stuff. There are one challenages after the other, like the DNS replication delay, the domain names, the large file (35M MySQL backup) importing, and file uploading. During the process, I upgraded to MovableType 2.66 to MovableType 3.2. I kept the resistance to update, because I want to spend time more on content instead of technical stuff – I am that type guy who enjoys geek happiness. If I had spent time to improve the system, I will found myself deeply dive into the technical details, even to create a lot of plugins without writing anything, like my friend Hacky did before. It is interesting that comment spams are my enemy, and it is also the enemy of ipowerweb, and finally, it turned out that I became their enemy to get rid of. The more interesting things are with the Great Fire Wall in China. Since I banned some spamers, and they happened to be on the ban list of the great censorship machine. As a result, I was not able to view anything in the blacklist tool before. It is the same. Be prepared that this site may experience further problems in the next few days. Several hours after the site was moved to another server, the site went down again. This time, I suspect to be because the great fire wall of China. People in some companies started to have problems to access the site, and then ADSL users. People in Beijing can still access, but I suspect they will not be able to view the site soon. Recently, the ICP requirements for blogs are greatly strengthed. My friends are complaining that their servers’ network cable are unplugged frequently because of not having recording with MII. The possibility to be shutdown for the site is now a real threat for me. Sorry that the blog was down for more than 7 days, since Dec 13, 2005. This is the most difficult time for this blog since it was created. I am working very hard to solve this problem and hopefully, the blog will be online before Christmas. As I explained for the 8 hour down time for this blog, the ISP I chose, ipowerweb.com found there is some phishing content on my site (as they said), and it was their legal responsibility to shutdown the site (also as they said). The result is, they deleted the content I built in the last 3 years within one minute. I am working with them to get the data from the backup server. Meanwhile, I have switched to another hosting company. I should have done this earlier. When you see this small note, it means the DNS change has been replicated to most DNS servers (at least yours), and the website is served from this new server. It is already a big progress. Saw this? Congratulations! You are a frequent visitor to this blog. There are about 8 hour outage of the service today. All pages under home.wangjianshuo.com are not accessible, including hosting services for my friends mvm, wendy, claire and elfe. What is pishing pages? I guess it is those who post comment to ask you to give them bank account so they can transfer huge amount of money from Africa… After some work, the site is back… I feel frustrated that there is technical problems after about one year of operation without big problems. What a surprise. Someone took homewangjianshuo.com. There must be a lot of people who forget to input the dot between home and wangjianshuo.com so to bring homewangjianshuo.com some traffic. So they collect the traffic, put it together with other smaller traffic they get from many mis-spelled domains and send it to this site. They must generate some revenue this way. I feel paranoid that someone started to look into the domain and want to secure more domains. I just bought wangjianshuo.org, wangjianshuo.net and jianshuo.org in case someone take it. The Yahoo! Domain offer of 2.99 USD is cheap enough to secure a domain – but the bad thing is, it offers to new customers only. It is very reasonable though. Cannot Comment on this Blog? Shirley, I got your email. I am sorry that you cannot post to this site. Maybe others also face the problem. Let me explain why it happens. To fight against comment spam, I implemented blacklist.cgi to filter the spams. As you may see, there are many comment spams on this site, and I added many banned URLs and words that commonly used in the spams to ban them. The result is, I am banning about 300 spam attempt every single day using the system. Packing my package and will leave San Jose and be back to Shanghai. The flight will take off around noon, and arrive in Shanghai at 7:45 PM the second day (Dec 15, 2005). Thanks for everyone’s host, and offering to host me. I may be back to San Jose early next year. Happy Christmas and Happy New Year to you. I am also in the support business as ipowerweb’s support team is. I have created 8 cases for IPowerWeb, called them at 1-888-511-HOST for support for three times (via non-toll free international distance call) and I even complained directly to their QA manager via telephone for about 15 minutes. Now the simplest thing to point wangjianshuo.com to the hsot they gave me is still pending. I have checked with the QA manager to see if I can publish the support cases to the website so you have an idea of how frustrated customer feels. It is a great experience for me to learn the support business from the customer’s perspective instead of from the support center. Wangjianshuo.com has been down for one week and it is pending on IPowerWeb’s support people to find out the problem – the simplest problem. They asked me to wait for 24 hours for the domain name to be alive, while I am very sure that it will not work no matter how long I waited – they just didn’t put it into their DNS server yet. Now it is in their DNS but point to the wrong IP address. Well. It takes another 24 hour to get a response. I have already paid for more than 100 RMB international long distance phone call fee for contacting them and paid much more money to hear the waiting music – average of 8 minutes. It proves a dissatisified customer will tell more than 20 persons about the experience. I hope I can post the emails between me and IPowerWeb soon after I get their confirmation. Please note that I am still working to migrate the site to my new host at IPowerWeb as my reader suggested. It was not easy and I have to focus on the technical stuff – at least the domain name wangjianshuo.com should work tomorrow. The process was by no means smooth and I have complained to the QA manager of the company after I tried to send about 6 cases to them. Anyway, the QA manager was very helpful and I hope the site will get back to normal status very soon. Please also be prepared that the site may goes down for some hours tomorrow. Just keep patient during the unstable time. I am sorry that I didn’t have time on new blog entry due to the migration, although I have a lot of stories to share regarding the recent house move to Pudong.